I’ve been waiting for the weather to warm up to make Sangria. A Christmas drinks party with friends seemed the ideal opportunity to try out a large jug of this delicious refreshing drink. It’s a perfect balance of fruit, citrus, spice and booze, a warm climate equivalent of mulled wine. 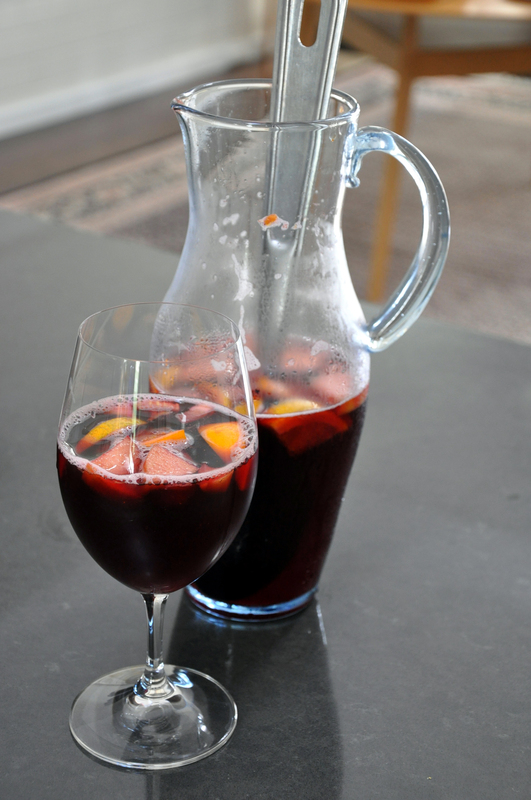 This recipe is a fairly close approximation of the contents of many jugs of Sangria we enjoyed whist in Andalucia last year. Salud! Chops the fruit into chunks then mix them with the brandy and sugar. Allow the fruit to macerate in the fridge for 24 hours. Just before serving, tip the fruit mix into a 2 litre jug, add the wine, soda and lemonade and about 1 cup ice. Serve immediately. This entry was posted on December 31, 2012 by ladyredspecs in Food, Gluten Free, Pantry Essentials.